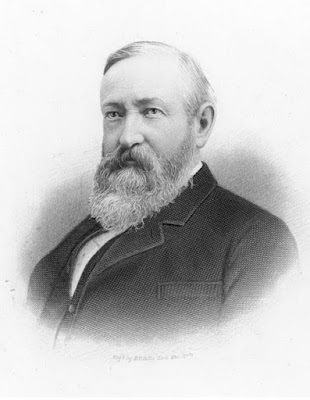 June 11, 1863 – The Chicago Tribune reports that Mr. John McAuley has successfully moved the first brick building, a two-story structure that will become the New York Dye House. Safe in its new location at 208 Clark Street, the building is “now in a s good condition as before it was moved,” reports the Tribune. In a rapidly growing city with lots and lots of room to build, house movers perfected their craft quickly. The Encyclopedia of Chicago notes that the industry had become so common in the middle of the nineteenth century that the Chicago City Council passed ordinances prohibiting more than one building at a time to stand in the streets or for any one building to stand in the streets for more than three days. 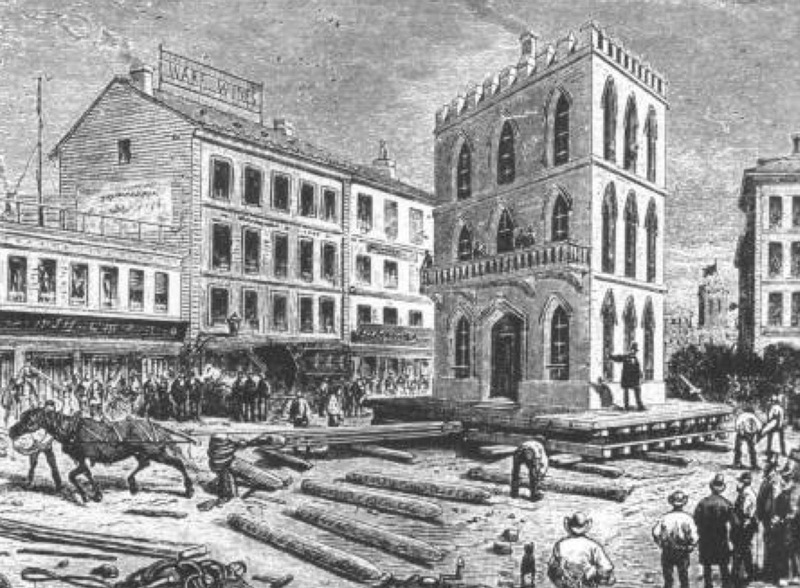 Over a period of a few years Chicago building movers became, perhaps, the best in the world, mostly because of the city’s attempt, beginning in 1855, to raise itself out of its own sewage by jacking up a significant number of buildings anywhere from four to fourteen feet. By 1890 1,710 permits were issued for the movement of structures throughout the city. That was the year that 33,992 linear feet, or 6.4 miles, of building frontage changed locations within the city. For more on the ability of Chicago to move its buildings around you can turn to this blog entry in Connecting the Windy City. 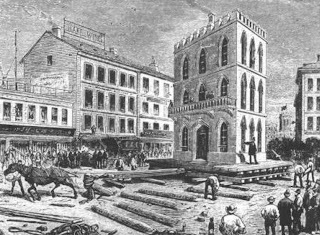 The above photo shows the raising of the Robbins Building in 1855, a building 150 feet long, 80 feet wide and five stories high, located at the corner of South Water Street and Wells Street. 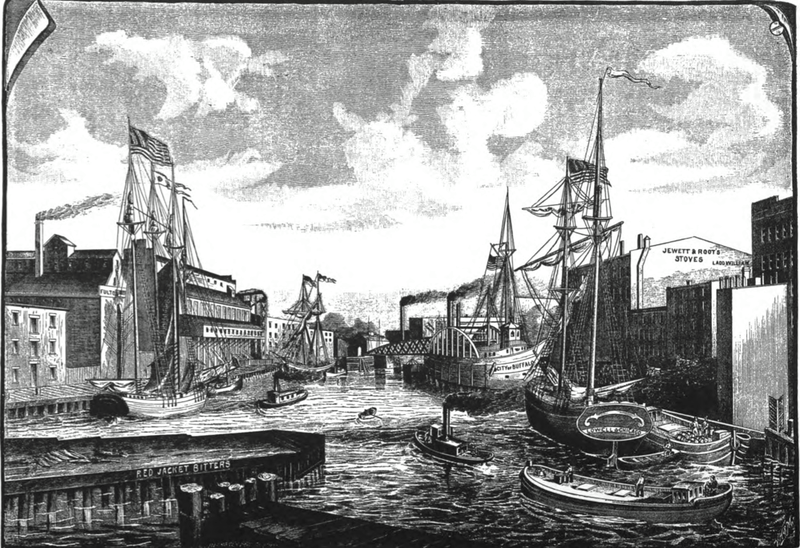 June 11, 1861 – An editorial in the Chicago Tribune once again screams at the foulness of the Chicago River . . . “Cross the river at nightfall and see what an odor of nastiness prevails there. It will breed a pestilence, this huge, filthy ditch, which reeks with the garbage of distilleries and slaughter houses, sewers, and cesspools, and the odorous refuse of the Gas Company. We do not remember to have ever before seen it as abominably unclean as now. The hot season is at hand. What shall be done? The question is an easy one to answer. Set the big pumps at Bridgeport at work, and in twenty-four hours time, fresh, pure water from the lake will take the place of this infamous broth concocted of all uncleanness and pent under the very nostrils of our citizens. Let the river be pumped out; it is high time.” [Chicago Tribune, June 11, 1861] It would be another 39 years before the river would be “pumped out” with the opening of the Chicago Sanitary and Ship Canal, but this piece does show that the idea for reversing the river had been under consideration for decades before the 1900 completion of the Chicago Sanitary and Ship Canal.